It’s cover reveal day for FALL INTO FOREVER! I’m so excited to finally be able to share. Isn’t it awesome???? The talented Pickyme did the cover and photographer extraordinaire Jenn LeBlanc shot the photo. Then I wrote the rest of their story. And as it turned out, one of the themes is control—Ivy has always felt powerless, but with Jon, she learns to take control of her life. So that’s why this image with her in the power position is perfect. FALL INTO FOREVER comes out March 10 (one week away! ), but until then, be sure to add it on Goodreads and sign up for my newsletter to get an email when the book goes live. This entry was posted in Beth Hyland, Fall into Forever, New Adult Romance and tagged Beth Hyland, cover, Fall into Forever, New Adult Romance on March 3, 2014 by BethHyland. Exciting news! 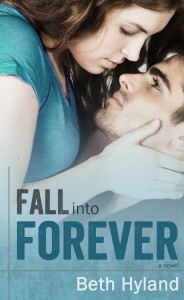 FALL INTO FOREVER has a release date: March 10. Xpresso Book Tours is doing a cover reveal on March 3. If you have a blog, you can sign up here. I’m super excited for you all to see it. I was lucky enough to be on the set of the cover shoot with the amazing Jenn LeBlanc, which was loads of fun. I had maybe 10,000 words written at the time, so I didn’t know Jon and Ivy’s story as well as I do now. The image I picked ended up mirroring one of the main themes of the book, which I hadn’t zeroed in on yet. I got to pick from about 25 photos shot that day and the one I chose just felt right, although I didn’t know why at the time. It’s so cool how your subconscious mind works. Then talented cover artist Trish Pickyme Artist took the image and turned it into a beautiful cover. I can’t wait for you all to see it! This entry was posted in Beth Hyland, Fall into Forever, New Adult Romance and tagged Beth Hyland, cover, Fall into Forever, New Adult Romance on February 13, 2014 by BethHyland.